Humans were designed to stand upright. And yet in this modern world, too many of us spend our days with our heads slumped over for a simple reason: we're staring at the tiny screen of a smartphone. People spend an average of 2 to 4 hours each day with their neck bent at this unnatural angle while shooting off emails or texts. That's 700 to 1,400 hours a year. The success of social media is has led to an epidemic of bad smartphone posture. The average adult head weighs 10 to 12 pounds when it's in the upright or neutral position. However, because of that pesky thing called physics -- gravitational pull -- the cranium becomes heavier the more you bend your neck. Several times heavier, according to research from Dr. Kenneth Hansraj, chief of spine surgery at New York Spine Surgery and Rehabilitation Medicine, which will be published in Surgical Technology International. His study found that bending your head at a 60 degree angle to get a better look at your selfie is putting 60 pounds' worth of pressure on your cervical spine, the portion of the spine above the shoulders. That's more than the weight of the average 7 year old. "The weight seen by the spine dramatically increases when flexing the head forward at varying degrees," write the authors in the study. "Loss of the natural curve of the cervical spine leads to incrementally increased stresses about the cervical spine. These stresses may lead to early wear, tear, degeneration and possibly surgeries." But it's not just the big slump that could eventually cause you to look like Lurch. Tilting your head a mere 15 degrees puts 27 pounds of pressure on your spine; a 30 degree neck tilt could equal 40 pounds of pressure; a 45 degree tilt adds the force of 49 pounds. It's no secret that correct posture is better for your back. According to the researchers, "good posture is defined as ears aligned with the shoulders and the 'angel wings,' or the shoulder blades, retracted." "In proper alignment, spinal stress diminished," they write in their paper. "It is the most efficient position for the spine." Standing tall doesn't just make you look better, it optimizes your health, too. Other studies have found good posture elevates testosterone and serotonin in the body, and also reduces levels of the stress hormone cortisol. Good posture has even been linked to personality traits such as tolerance for risk-taking. People who have poorer posture often have poorer physical and emotional health. The researchers define bad posture as "the head in a tilted forward position and the shoulders dropping forward in a rounded position." Bad posture has been linked to a host of medical problems, including headaches and other neurological problems, depression, constipation, and heart disease. At a minimum, constant slouching is likely to cause a lot of chronic pain. This is why Hansraj said it's important to be mindful of your smartphone posture. 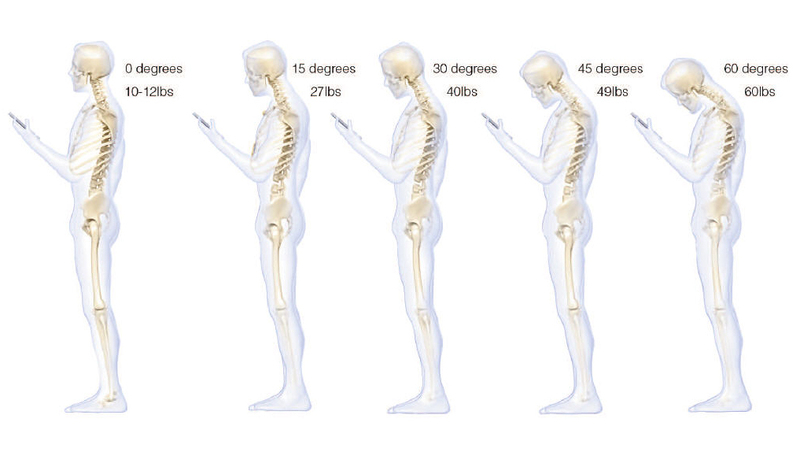 "While it is nearly impossible to avoid the technologies that cause these issues, individuals should make an effort to look at their phones with a neutral spine and to avoid spending hours each day hunched over," the authors write in their study.